Follow award-winning chef Shane Delia as he visits souks and local kitchens in six countries. From Morocco, Malta, and Andalusia in the West, to Turkey, Lebanon, and Iran in the East, the food and flavors of the Middle East permeate almost every aspect of daily life. Orange blossom and rose petals, spice-encrusted slow-cooked meats, fermented yogurts, dates, and olivesthese are the flavors that have entranced visitors for centuries and that have recently experienced a surge in popularity in Western kitchens. Award-winning Maltese-Australian chef Shane Delia journeys to both the well-trodden souks and private dining rooms of locals across six countries, in search of the most exciting local flavors to bring back to his kitchen. 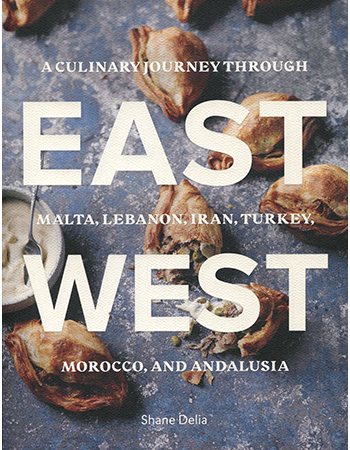 East West offers 80 recipes, distilled for the home cook. Accompanied by hundreds of stunning images shot on location, this is a book for foodies and anyone who has ever dreamed of taking their own culinary journey. Shane Delia is the star of the television show "Shane Delia's Spice Journey," and the chef and owner of Maha Restaurant and Biggie Small's Kebab Shop. He is based in Melbourne, Australia. His Lebanese wife Maha is the inspiration and namesake of his restaurant. This is his second book.